It drives faster in tighter spaces, than any other 12-Volt right angle impact driver on the market. With a 1/4 inch head diameter and the ability to use with most 1 inch bits, the M12 1/4 inch Hex Right Angle Impact Driver offers users maximum access for hard-to-reach fasteners. The tool provides the most power and highest RPM in its class and is optimized to run at full speed throughout the toughest applications. Variable speed with an extended paddle switch provides tradesmen maximum control and the ability to operate their tool from multiple grip positions. Get maximum life out of the M12 1/4 inch Hex Right Angle Impact Driver. Powered by REDLITHIUM Battery Pact which delivers more work per charge and more work over pack life than the competitors. REDLINK Intelligence provides optimized performance and overload protection against abusive situations. 1/4 Inch M18 2-Speed Hex Impact Driver Kit The Milwaukee M18 Cordless 2-Speed 1/4 in. Hex Impact Driver Kit offers incredible performance and power-to-size ratio. Featuring a Milwaukee-built 4-pole frameless motor and optimized impact mechanism, this impact driver delivers up to 2750 RPM, 3450 IPM and 1500 inch lbs. of fastening torque for class-leading performance. Its unique design offers multiple speed/torque modes through a proprietary 2-mode drive control and also features REDLINK Intelligence, providing overload protection using total system communication between the tool, battery and charger. For convenience, an all-metal, reversible belt clip is also included for temporary tool storage. 1/4 Inch M18 2-Speed Hex Impact Driver Kit is rated 4.9 out of 5 by 127. Rated 1 out of 5 by Dave from Both batteries were defective. I had to go to my... Both batteries were defective. I had to go to my local store where they exchanged them for me. I like the tool but was expecting it to work the first time out of the box and it didn't. Rated 5 out of 5 by Ryan from Great tool! I am a contractor and use this tool almost everyday. It has the power I need. Very durable. Love the battery power indicator. The battery last for days. Can't say enough good things about this impact drill. If your looking to buy, hands down best one out there. Rated 5 out of 5 by Anonymous from Great Tool Great tool. Does exactly what it is supposed to do, well. Fast charging battery. Rated 5 out of 5 by Charlie from Highly recommended, good price. 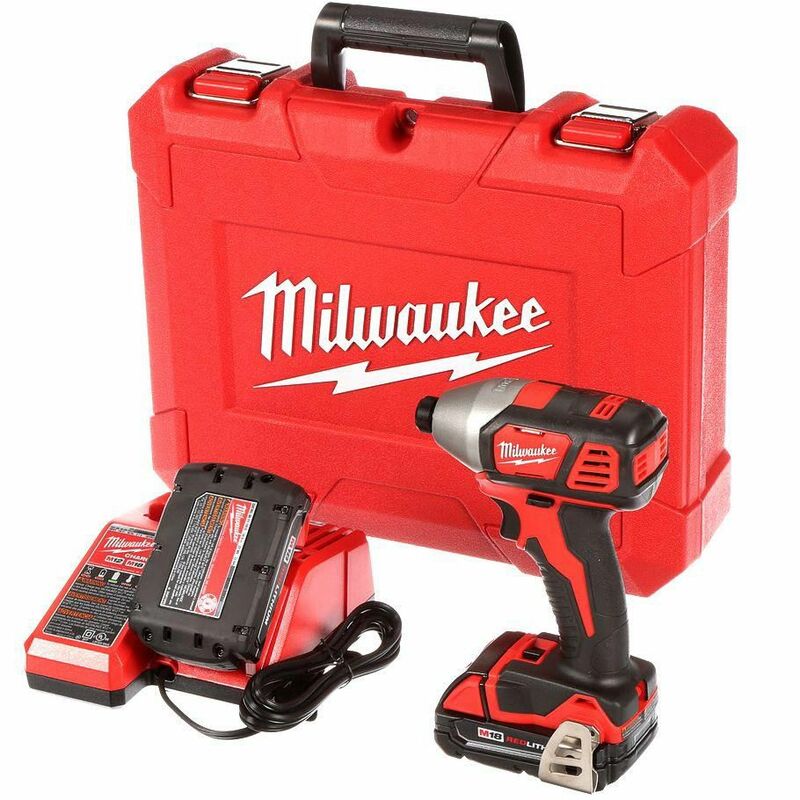 Very easy to use, Milwaukee brand is tough and strong, and have an excellent service. Rated 4 out of 5 by caulboy from quality impact Impact is well balanced and the two speed setting is nice. You can go from screwing decking down to installing light fixture screws. And it's durable I've accidentally dropped it off a second story roof. And still it rattles away. The reason for four stars is the batteries don't last that long. Overall a good buy though. Rated 5 out of 5 by bob from Best Impact Driver Amazing drill, Best one out there by far. Power is amazing and battery life is good. Rated 5 out of 5 by MM from Steal for the price. Sale price made it impossible to pass on. More than enough power for any job. Rated 5 out of 5 by Skovac from Great for working on cars I bought some hex socket adapters and use it to work on my car. This can remove old rusted bolts pretty well, I have come across a few that gave me a hard time but overall it works well. Everything seems well built, nice case and I like that it came with two batteries.